WASHINGTON — A commercial crew contract modification moves NASA one step closer to using a test flight as an operational mission to maintain a presence on the International Space Station. NASA announced April 5 that it had updated its Commercial Crew Transportation Capability (CCtCap) contract with Boeing to study potential changes to the second of two test flights of the company’s CST-100 Starliner vehicle, currently intended to carry two people on a short-duration mission to the station. Those changes, NASA said, would involve adding a third crewmember to flight and extending its mission from two weeks to as long as six months, the typical length of an astronaut’s stay on the ISS. The changes would involve training and mission support for that third crewmember and the potential to fly cargo on both that mission and an earlier uncrewed test flight. NASA said in the statement that adding the third astronaut, and extending the mission’s stay, could “could allow for additional microgravity research, maintenance, and other activities” while at the station. 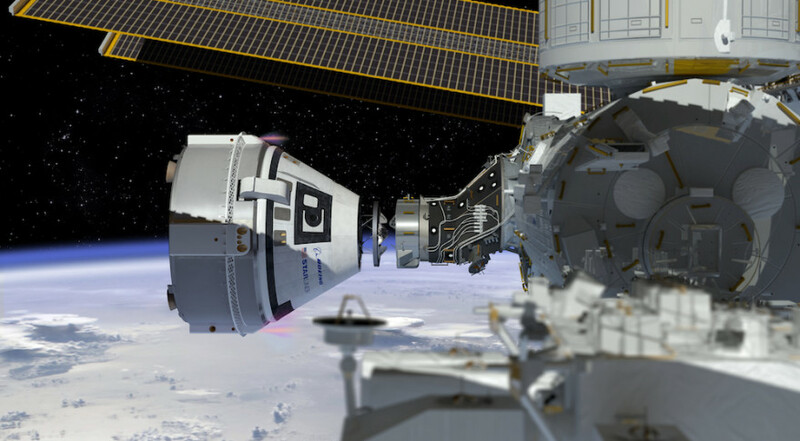 The agency acknowledged, though, that it could also be used to maintain a U.S. presence on the station should the development of both Starliner and SpaceX’s Crew Dragon vehicles experience more delays. “This contract modification provides NASA with additional schedule margin if needed,” said Bill Gerstenmaier, NASA associate administrator for human exploration and operations, in the statement. Gerstenmaier said then that the changes envisioned included adding a third crewmember and extending the test flights to bridge any schedule gaps until at least one commercial crew vehicle is certified by NASA for regular flights to the station. He said then that he hoped to reach a decision this summer on whether this approach would work. NASA has limited options for accessing the ISS after next year. NASA acquired three Soyuz seats from Boeing for flights to the ISS in the spring of 2019, seats that Boeing obtained from Russian company RSC Energia as part of a settlement of a lawsuit between the two companies regarding Sea Launch. Astronauts flying on those seats would return to Earth in the fall of 2019, at which point NASA would lose access to the ISS unless at least one commercial crew vehicle is online. Gerstenmaier has previously said that buying additional Soyuz seats is not an option given the long lead times required for Soyuz production. In the statement, NASA said that it was approached by Boeing last year about the contract change. SpaceX’s CCtCap contract is not affected by the change. “If SpaceX submits a proposal for their crewed flight demonstration, the agency will review it through the normal procurement process,” NASA spokesperson Cheryl Warner said April 6. Gerstenmaier, in the statement, noted that NASA has about six months of schedule margin in current commercial crew development schedules. However, those schedules have slipped considerably in the past, raising concerns that additional delays could jeopardize continued U.S. presence on the ISS. NASA’s last update on commercial crew test flight schedules, released in January, listed Boeing conducting an uncrewed test flight in August 2018 and a crewed test flight in November. SpaceX’s schedule includes an uncrewed test flight in August and a crewed test flight in December. If companies remained on those schedules and had successful test flights, they would be in line to be certified by NASA for operational missions in early 2019.